I wore my pedometer again today and I have almost reached 10,000 steps!! But do not be jealous of my madd step skillz. The only reason I have so many steps today is because my thrifty husband made us park about 2 miles away from the basketball venue because it was free parking. People, I would gladly trade the steps on this trusty ole pedometer for a ride in one of those carriages pulled by a man on a bike. The pedometer AKA My new BFF: It fits snugly onto my pants and is hidden by my shirt. So great! Luke has a good friend named Will, and now, through marriage, Will has become one of my good friends. We tend to have lots of fun when the three of us are together. Well tonight Luke gave Will a key to our apartment because he had to get something out of it and we would be at the BBall game. Will sent Luke a text and said that he left a surprise for me. None other than the SNUGGIE!!! I know they are laughed at. I know they are ridiculous looking. However if you had to spend one night in my body temperature then you would understand my need for the wonderful Snuggie. I was seriously so excited!!! It was like Christmas morning. I was jumping up and down when I saw the Snuggie box. And do not think those steps went unnoticed on my pedometer! Luke thought it was quite funny how excited I was about a blanket with sleeves! I am now ready to watch TV cuddled up in my new blanket!! the pic of you in the snuggie is absolutely hilarious and i am laughing so hard right now! and i'm not even sure why! 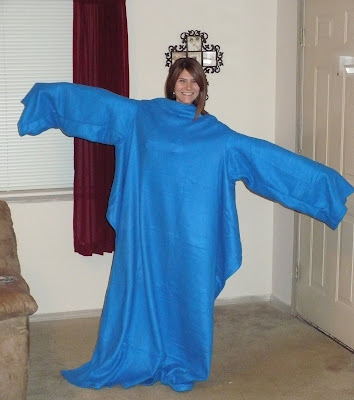 I got a snuggie for Valentines Day and I love it! I dont care if it looks silly its keeping me warm!!! Oh I'm so jealous!! I want a Snuggie! I may have to order myself one!! YAY!!!! I LOVE my Snuggie...you will too! It's kind of weird how much I wear it. I cooked dinner in it the other night. Never once did I think it was weird...HA! Madelynn and Maggie want one of these so bad!!!! That is hilarious! i LOVE my snuggie! They are so awesome and all those people who make fun, just don't understand how wonderful they are! Enjoy it! Snuggies are taking over the world!!! That one looks like you & a few friends can get in it! Its HUGE! How cute are you to get so excited about it... you are a doll!!! And yeah, jealous of your walkin' skillz... fo sho!! You know my beliefs about the Snuggie (deep love). What a wonderful gift!!!! You wear it well my friend! Too funny !! Now you'll stay warm.. I think you can fit your hubby in there with you! haha, thats so cute!!! It looks really nice and warm! I have something similar to that - its more of a shaw but its really nice and warm!! OK - Have you thought about just wearing your robe backwards? That's a snuggie. LOL!! 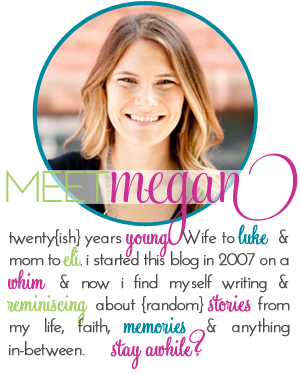 Oh my goodness megan! I love this pic.. make it your new facebook picture... I want a snuggie!! you look so cute in your snuggie! i love seeing pictures of people in their snuggies! they are so cute!! I am super impressed that you reach 10,000 steps a day! I can barely average 5,000. You must walk a ton at work! Good for you! No way!! HILARIOUS! Now, is the snuggie the one with the pockets, or is that the slanket?? Oh wow! Those things are hilarious! You look cute in yours though, what a sweet friend! Is your pedometer accurate? I wore won a lot last spring and my husband didn't think my pedometer kept an accurate track of my actual steps. I love the snuggie! One thing I hate is when a blanket isn't long enough to cover your feet. The Snuggie looks MORE than long enough for that! Oh the snuggie looks so warm and cozy, what a great surprise!! I love NBA games...so much fun! Girl, you are too cute. I ditto what Jill said! I was thinking the same thing. How sweet of Will! LOVE you in the snuggie! That is a pretty blue and I think I might need one of these! You are such a sweetie...I think we have the same thought-processes, too. Love ya! I think the Snuggie is hideous. Then tell me why I'm dying to own one. And why I was so upset on Christmas Day when no one took my request for one seriously?!?! The Snuggie is awesome! I've never seen one, but it looks like what I need in my office. I keep my heat up but walk around shivering - enough so that people notice and feel the need to comment - through the rest of the office. That snuggie is TOO funny!!!!! The blue color though, I like, haha. Where was the game?? oh - and I think my husband and I should come to listen to your husb's band! when? where? That is hilarious! That snuggie swallows you up! Love the jeans you have on, girl!